Folding polyester sun shade for car windscreen with contrast trim, black elastic retainer strap and handy storage pouch. 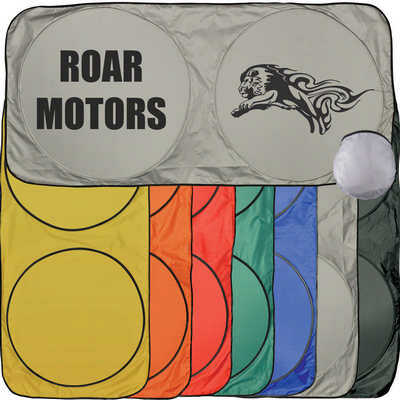 Colours - Black/Silver, Blue/Black/Silver, Green/Black/Silver, Orange/Black/Silver, Red/Black/Silver, Silver/Black, Yellow/Black/Silver Size - 1500mmL x 700mmH, folds to fit in 260mm Diameter Pouch Decoration Area(s) - Screen Print (Max 1 colour print) : Sun Shade Panel/s - Circle 500mm Diameter, Sun Shade Pouch - Circle 145mm Diameter. Price includes : 1 Col 2 Pos Print on Sunshade via Air Freight. Setup is included.